If you're playing at home, this is an especially bad season to get into a shootout. Home teams haven't had a winning percentage in shootouts since the first season of the tiebreaker -- the only one in which the home team was, by rule, forced to shoot last. Beginning in 2006-07, home teams were given the option to shoot first -- and they haven't won half the shootouts in any season since then. But 2010-11 has been especially tough for home teams. Of the 100 shootouts this season (in 868 games played), only 39 have seen the home team leave with a win -- and unlike the last couple of seasons, it hasn't mattered for most teams whether they go first or last. Home teams that go first have seen their winning percentage plummet from 49.01 percent last season to 39.24 percent (31-for-79) so far this season. But unlike the last couple of seasons, when home teams that opted to shoot last had winning percentages, this season they are winning just 38.10 percent of the time (8-for-21). Shootout woes at home seem to have no relationship to how well a team does in the standings, however. Edmonton, last in the overall standings, is 1-4 at home in shootouts -- the exact same mark as the League-leading Vancouver Canucks. One for the books -- Teams that score first in shootouts have won just a tick under 80 percent through the first five-plus years of the tiebreaker. That's what made Buffalo's 3-2 shootout win in Montreal on Tuesday all the more remarkable. The Sabres overcame a 2-0 deficit just to get to the shootout, then spotted the Canadiens a 2-0 lead in the tiebreaker before rallying to outscore Montreal 4-3. That made Buffalo only the second team ever to overcome a 2-0 deficit in a shootout -- Washington did it against Pittsburgh last March 24. In some ways, that Caps comeback was even more amazing; they needed only four rounds to win, scoring on each of their last three shots. The Sabres had to go 10 rounds before Jochen Hecht beat Carey Price for the winner. One record the Sabres and Canadiens failed to break was the most goals in a shootout -- they became the 15th teams to combine for seven successful attempts in a single tiebreaker. A lot has happened in the great rivalry between the Bruins and Canadiens, but their last encounter certainly was one of their more memorable battles. Sometimes scorers -- The Washington Capitals had to be thrilled to see Alexander Semin regain his scoring touch with his hat trick in Wednesday's 7-6 win at Anaheim. Now if they could just get him to be a little more consistent. The hat trick was Semin's fourth of the season, tying him with Buffalo's Drew Stafford for the most in the League. The problem has come when he doesn't get a hat trick -- he has just 9 goals in the other 40 games he's played. Before Wednesday's big night, he had gone 17 games without a goal and hadn't scored since Nov. 28. Semin has a running mate in Marian Gaborik of the New York Rangers, who has three hat tricks this season (one of them a four-goal performance). However, Gaborik has scored just seven times in his other 42 games, including a goal against Los Angeles on Thursday. February fun -- Maybe a long road trip was what Los Angeles defenseman Drew Doughty needed to find the net. The Kings have played their first eight games in February on the road, and Doughty has 4 goals in those games, which matches his entire output prior to this month. He even had his first 2-goal NHL game Feb. 2 against the Oilers. Doughty still has a way to go to match last season's total of 16 goals, but at least he's getting them at the right time. All eight of his goals this season have come in games the Kings have won. Right place, right time -- The New York Islanders recently gave defenseman Milan Jurcina a contract extension through next season. Now they need to make sure he stays healthy. Jurcina isn't a big scorer, nor is he a huge hitter. But the Isles unquestionably have been better with him in the lineup. In the 33 games he's played the Islanders are 18-12-3; in the 25 games he's missed with injuries, they're just 3-18-4. 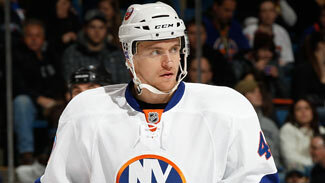 Making the most of his time -- Islanders rookie Michael Grabner has made the most of his limited ice time. Grabner had a six-game goal-scoring streak ended in Thursday's 6-3 loss to Boston, but he still has 16 goals in his last 16 games. He became the first rookie to reach the 25-goal mark when he scored shorthanded in Ottawa on Tuesday. Amazingly, he's gotten his 25 goals while averaging just 14:07 of ice time. Seven of the other 13 players who have reached the 25-goal mark have averaged more than 20 minutes per game, and only Detroit's Johan Franzen (17:37) has averaged less than 18. Among the 39 players with 20 or more goals only Grabner and Buffalo's Drew Stafford (15:59) average less than 16 minutes per game. Grabner's six-game goal-scoring streak tied Detroit's Danny Cleary for the longest in the NHL this season, and the longest by a rookie since Pittsburgh's Evgeni Malkin scored in six straight games in 2006-07.